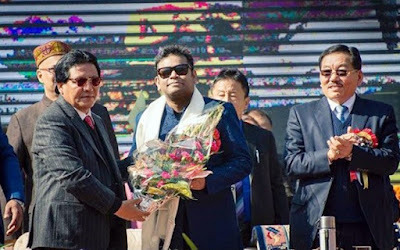 The Chief Minister of Sikkim Pawan Chamling officially declared A R Rahman to be the new Brand Ambassador of Sikkim. This announcement was made at the inaugural ceremony of the Sikkim Red Panda Winter Carnival 2017-18 at Paljor Stadium, Gangtok. It is an annual tourism event organized by the state tourism department. A R Rahman, in his acceptance speech, conveyed his pleasure at being anointed as Sikkim’s brand ambassador. He expressed appreciation for the immense beauty of the Himalayan state of Sikkim. He also appreciated Sikkim’s initiatives in diverse fields and the warmth and hospitality of the people. Rahman further mentioned that Sikkim has grown to be one of the most environmental-friendly and beautiful places in the world. Therefore its beauty should be appreciated and steps should be taken to preserve its glory. He also added in his speech that the tiny Himalayan state of Sikkim was an example of tolerance, compassion, peace, integrity and communal harmony for the rest of the country. Sikkim is a state in the North East India and is the least populated and the second smallest state in India. The kingdom of Sikkim was founded on the Silk Road by the Namgyal Dynasty in the 17th century. It was ruled by a Buddhist priest king Chogyal and it became a princely state of British India in 1890. A referendum in 1975 led to Sikkim joining India as its 22nd state. Sikkim is the world’s second largest producer of spices after Guatemala. There are total 11 recognized languages spoken in Sikkim.